This is a beautiful 1888 Rand McNally and Company map of New Mexico. It covers the state of New Mexico along with parts of neighboring states. 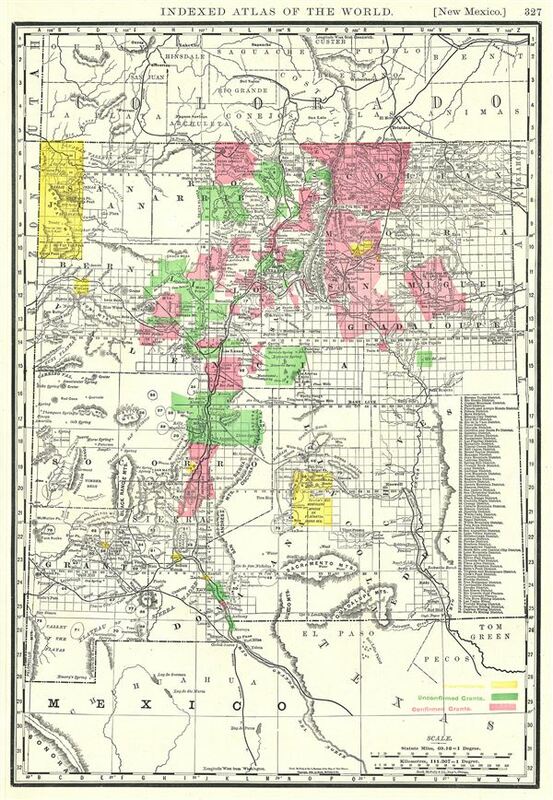 This highly detailed map notes several towns, rivers, mountains, railroads, Indian reservations, confirmed and unconfirmed land grants, mining districts and several other topographical features. The map also delineates survey grids and plats referencing the work of the U.S. Land Survey. Color coded according to reservations, confirmed and unconfirmed grants, elevation is rendered by hachures. An index along the right margin identifies the mining districts noted on the map. This map was issued as plate no. 327 in the 1893 edition of Rand McNally and Company's Indexed Atlas of the World- possibly the finest atlas Rand McNally ever issued. Rumsey 3565.144 (1897 edition). Philips (atlases) 1026 (1898 edition).